This past weekend I visited Springfield, Oregon to give the keynote address for an Oregon Association of School Libraries (OASL) regional conference. I gave a spirited talked entitled, "Library Evangelism 101," in which I shared the learnings from the School Library Advocacy effort in the Beaverton School District. In my opening remarks, I warned folks that I would talk fast, share an abundance of information, and potentially overwhelm them in the process. I'm pretty sure I accomplished all three! I tried to reassure folks that it would not be possible to incorporate all of the ideas I talked about, and encouraged participants to try to identify one or two or three things they could personally incorporate. It was exciting to hear people percolating with ideas. I look forward to hearing the action items that people commit to and follow through with. 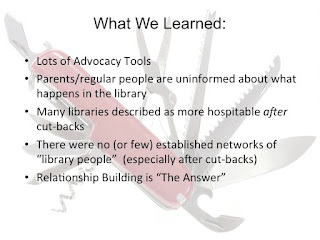 Case in point, just last week I heard about another school library advocacy effort in the Eugene area that got off the ground after I gave a similar talk at the OASL state meeting last fall. 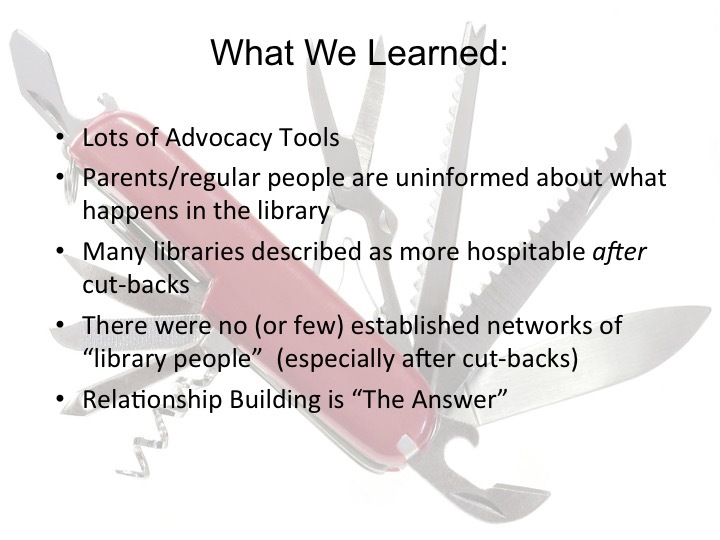 I genuinely believe that if we each plant and nurture a few seeds of library advocacy in our own areas, the results from our collective advocacy efforts will be bountiful. Please get in touch if you'd like me to present "Library Evangelism 101" in your area. (If you'd like a preview, click here for an article that I wrote for the SchoolLibraryAdvocacy.org blog that touches on a couple of the topics I address in the workshop). If you'd like to access the slides for "Library Evangelism 101," please send me an email, or message me via the contact form on the left side of the blog. I'd love to hear about the school library advocacy efforts in your own area. I hope you will share what's going on in your area in the comment section below.